Ciao ♥ It's sunny outside, the weekend is near and summer is soon come. 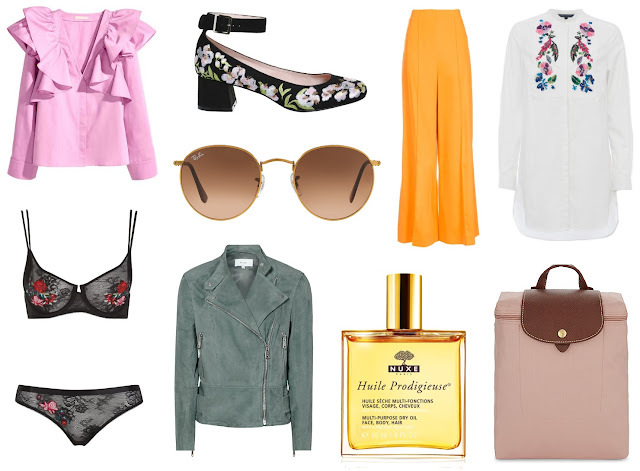 What more could you possibly want right now - and that's not taking into consideration all of the items that are currently sitting in your favourite store's online basket - perhaps a new outfit post from moi will make your day that tad bit sweeter. So, I treated myself to this gorgeous leather jacket a few months ago and have patiently been waiting for the weather to be what it is now to wear it. I love that it's not your typical black leather biker jacket, not only in terms of colour, but also the style of it. It has a fine ruched detailing on both sleeves and at the bottom of the jacket and has two large pleats on the bottom sides. Additionally, it features an extra long belt which creates a lovely silhouette when pulled in at the waist. I was initially going to wear my grey glove mid heels but opted for my red pair instead as I thought this outfit could do with a pop of colour. These type of heels (very Celine-esque) have been hot on the fashion scene since last year and are here to stay for SS17. Ciao ♥ Long time no see. How are you? How's everything? What's new? It's certainly been a while since I've been on here. Almost seven months. That's a bloomin' long time come to think of it. I guess some of you are wondering where I've been and what I've been up to. Hmm! 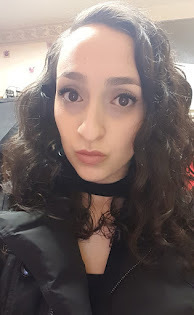 To be honest I don't quite know where to begin... and yes the start would obviously be a good place but there's not much to say other than I simply didn't feel like blogging. Psh! You can't blame a girl for being honest especially considering that honesty is the best policy. However, that's not to say I didn't try because I did, I really did. In fact, I probably tried more times than you could possibly imagine but the same thing happened each and every time; after taking what felt like forever to put together a few sentences, I'd end up clicking that ever so tempting x button and told myself I'd try again soon. Of course soon eventually turned into weeks, then months and has unexpectedly landed me here today. I guess I'm just not about that whole 'trying to force something' way of life. After all there's no point wasting your time and effort on something if your heart and mind are not truly invested in it. When in doubt take a step back and re-evaluate the purpose of it. I know it's a little too late to wish y'all a happy new year but I do hope it has been good to you so far. Considering March is just around the corner it seems that 2017 is going to pass us by just as quickly as 2016 did. Looking back 2016 was a memorable year and for all of the right reasons. It was a year full of growth and progression. I passed my driving test in March - on my first attempt might I add, got a car in May and finally started climbing the ladder for my chosen career in August - I'm now a HR Administrator and loving it. It's fair to say things only got better as the year progressed. God willing this year will be just as productive if not better. Ciao ♥ Dang! It's been a hella long time since I last published a post but - BOOM - I'm back, and better than ever. Seeing as it's long time no speak, how are you guys? I hope you're all doing fabulously well and having a great summer, even if the weather is slightly poo-ish (damn you British weather).. or not if you're somewhere warm (lucky sod). I can't really complain though as I've just come back from a relaxing girls holiday to Marbella, Spain. So prepare yourself as I've literally got a gazillion and one outfit posts to share with y'all. Apart from the obvious holiday outfits, I've also got some festival and evening wear ones.. all which will be coming at you left, right and centre over the next few weeks. 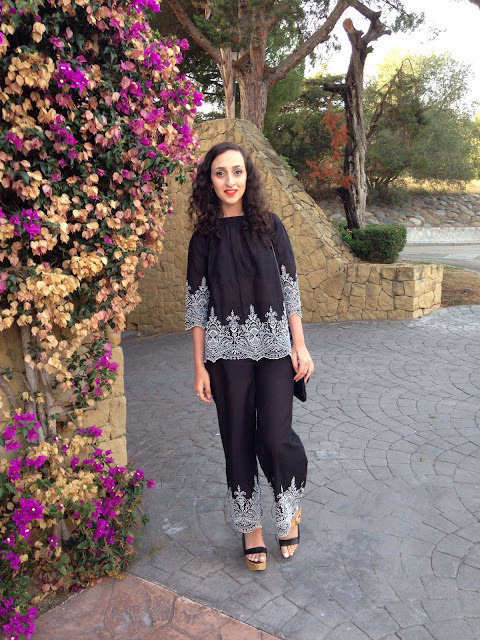 In today's post I will be sharing the outfit I wore on my first evening out in Marbella. This beautiful two piece is from Zara, as are my block sandal heels. Besides the gorgeous and elegant detailing, this outfit is airy and lightweight - perfect for a warm summer's evening. I paired it with my favourite red lipstick: MAC's Lady Danger, to add a pop of colour to the look. What do you guys think? Are you a fan of two-pieces? If so, where's your go-to place to buy them?